Disney treated us to an early screening of Guardians of the Galaxy Vol 2 which will be released in movie theaters on May 5, 2017. The movie stars Chris Pratt (Star-Lord), Zoe Saldana (Gamora), Dave Bautista (Drax), Bradley Cooper (voice of Rocket), Vin Diesel (voice of Groot) who all made a splash the first time around as a funny adventuring ensemble. Michael Rooker is back as Yondu and has a much larger part the second time around which can also be said for Karen Gillan who plays Nebula. Guardians of the Galaxy Vol 2 was directed once again by James Gunn and welcomes newcomers Kurt Russell, Sylvester Stallone, Pom Klementieff and Elizabeth Debicki. Just like the first Guardians of the Galaxy movie – GOTG Vol 2 offers up a light-hearted take on the galaxy far far away with familiar characters, technology and a diverse musical soundtrack lifted from the late 1970s and early 1980s. The first Guardians of the Galaxy film was all about finding out who these characters are and whether or not they can stop the super-powered entity known as Ronan. Guardians of the Galaxy Vol 2 is more of a character study on what makes each person tick and the dynamic between the group who all have their own inner and outer conflicts. The first movie felt like non-stop action but GOTG Vol 2 slowed down the pace and a good portion of the middle of the movie is dialogue scenes and exposition. Probably the least interesting scene to watch was when one of the new characters explained their own history and backstory – this is never a good cinematic device to watch but fans seemed to also eat it up in Ant-Man. Ultimately what makes the Guardians of the Galaxy movies fun and entertaining is their unique characters and banter between them and this has been ramped up for GOTG Vol 2. In many ways, the second film feels more like a comedy and not so much an action-packed adventure. 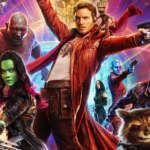 Guardians of the Galaxy Vol 2 does contain plenty of action and is a feast for the eyes but you’ll find yourself caring more about the emotional moments and comedy beats than anything else – mostly because they take up the bulk of screen time. It’s also worth noting that most of the questions you may have had leftover from the first movie are answered in the second film with only a slight tease/Easter egg as to what we may expect in the upcoming Guardians of the Galaxy third movie.